Born in the Watts community of Los Angeles, Coleman escaped a life as a welfare mother after the post 1965 rebellions by becoming involved in a number of social organizations designed, as she has put it, to channel “the riotous” energies of young Black Americans into constructive modes. She worked as a medical secretary, a magazine editor, a journalist and scriptwriter, all the while writing poetry and taking various creative writing courses, including a course with Clayton Eshelman. 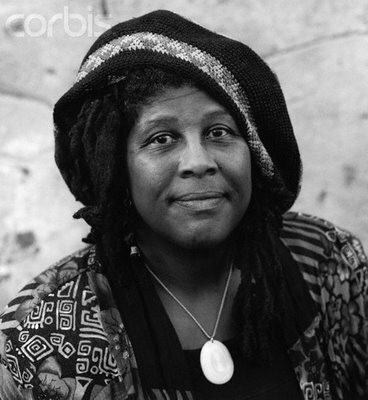 She began publishing poems in the late 1970s, and published her first book, Mad Dog Black Lady with the famed Black Sparrow Press in 19779. From the beginning her work was deeply concerned with issues of racism, but over the years she has gradually transformed her work from a dramatic performative representation of inner city African Americans to a more experimental investigation of voice and the positing of the Black American. Although her influences include Black writers such as Phyllis Wheatley and Paul Laurence Dunbar, she also cites other writers such as Walt Whitman, Herman Meliville, Edgar Allen Poe, Edna St. Vincent Millay and Emily Dickinson. Among her many books of poetry, most published by Black Sparrow, are Heavy Daughter Blues: Poems & Stories 1968-1986, African Sleeping Sickness, Hand Dance, Native in a Strange Land, and Mercurochrome. She has also written short stories, longer fiction and memoir. orchard’s sky. is this the world i loved? night’s grazing? stampedes my soul? (language cannot contain this magnitude of afro-agony. the demise of the deliciously clandestine. lost confidence. all these years wasted. who will be left to care or carry on? first slow then slower. light hurts. watch. the children with tongues like wolves. private smile. “buy something, some trinket. Reprinted from American Sonnets (1-24) (Milwaukee: Woodland Pattern/Light & Dust Press, 1994). ©1994 by Wanda Coleman. Reprinted by permission of the poet. Reprinted from Mercurochrome: New Poems (Santa Rosa: Black Sparrow Press, 2001). ©2001 by Wanda Coleman. Reprinted by permission of David Godine. Reprinted from Ostinato Vamps (Pittsburgh: University of Pittsburgh Press, 2003). ©2003 by Wanda Coleman. Reprinted by permission of University of Pittsburgh Press.